Thugger freezes for the new online trend. Rae Sremmurd set the bar for the #MannequinChallenge last week when they got thousands of fans to join them in the viral video craze during a live show. 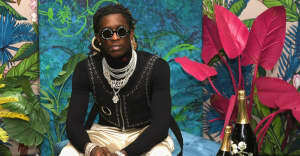 Young Thug is the latest artist to get in on the online trend, in which people create a scene by posing completely still, and upped the ante by filming it on a private jet. The video above shows his challenge, while also teasing new music featuring 21 Savage. The untitled track plays in the background of the challenge video. Thugger and Savage begin their ‘HIHORSE’D’ tour later this week.